This is also known as Sybase Replication in HANA system. The main components of this replication method are the Sybase Replication Agent, which is part of the SAP source application system, Replication agent and the Sybase Replication Server that is to be implemented in SAP HANA system. Initial Load in Sybase Replication method is initiated by Load Controller and triggered by the administrator, in SAP HANA. It informs R3 Load to transfer initial load to HANA database. The R3 load on source system exports data for selected tables in source system and transfer this data to R3 load components in HANA system. 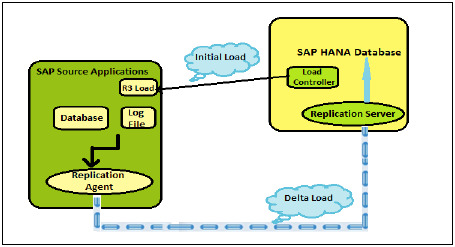 R3 load on target system imports data into SAP HANA database. SAP Host agent manages the authentication between the source system and target system, which is part of the source system. The Sybase Replication agent detects any data changes at time of initial load and ensures every single change is completed. When th ere is a change, update, and delete in entries of a table in source system, a table log is created. This table log moves data from source system to HANA database. The delta replication captures the data changes in source system in real time once the initial load and replication is completed. All further changes in source system are captured and replicated from source system to HANA database using above-mentioned method. This method was part of initial offering for SAP HANA replication, but not positioned/supported anymore due to licensing issues and complexity and also SLT provides the same features. Note − This method only supports SAP ERP system as data source and DB2 as database.